When it comes to making brunch, I'm a sucker for pancakes. Perhaps it's my sweet tooth talking, but I find a plate of fluffy pancakes drizzled with maple syrup simply irresistible. So when there's a savoury dish that comes along and blows my mind, you know it has to be THAT good. I've been hearing so many things about Table 17 for the past few months now and finally made it out to the restaurant last week. 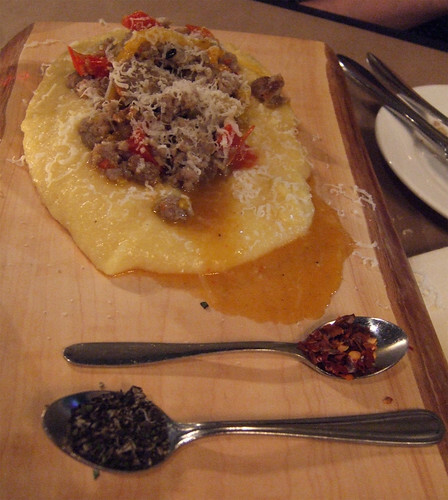 While their popular hot balls were delicious, I was super impressed with their polenta dish—soft and creamy and served with a house-made sausage sugo. It left such an impression on me that I knew I had to remake this dish at home, and make it soon. 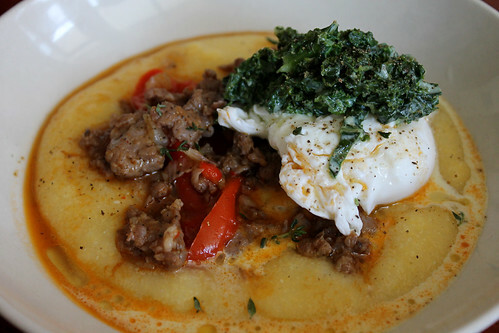 I love the saltiness of the sausage sugo paired with the creamy, bland polenta, and there's so much great textures going on in this dish. 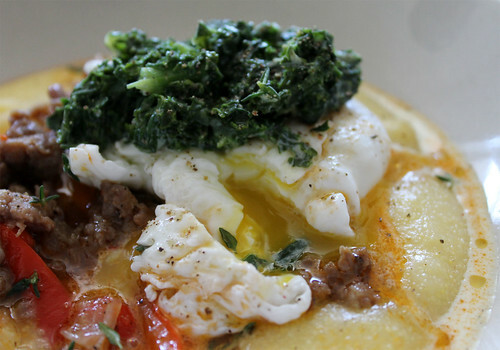 Serve with a poached egg and some creamed kale, and you have my new favourite brunch dish. Heat a heavy, medium pan over medium heat. Add the fennel seeds and toast until fragrant, about 2 minutes. Add some olive oil to the pan and the onions to the pan. Cook until beginning to soften, about 5 minutes. Add the garlic and the red peppers and cook until beginning to soften as well, another 5 minutes. Add the sausages to the pan and break it apart with a wooden spoon. Cook for a few minutes, until almost cooked through, and add the tomato paste and a good splash of red wine and chicken stock to the pan. Cover, lower the heat to medium-low heat, and simmer for about 15 minutes, until the red peppers are very tender. If the liquid dries too fast, add some more chicken stock to the pan. While the sugo is simmering, bring 3 cups of water to a boil. Bring the remaining 2 cups of water to a simmer and keep warm. Whisk in the polenta to the pot with 3 cups of water. Stir and when water has been absorbed, add a ladle of the hot water to the polenta. Keep adding the water and stirring until you get a creamy consistency, about 5 minutes. Add the butter and stir to melt. Season the sugo, if needed. Spoon polenta into 4 dishes (or onto one large platter to serve family-style). Top with the sausage sugo, making sure to spoon the sauce over the sugo and polenta as well. Drizzle with a little olive oil, sprinkle over with some thyme leaves, and serve with chilli flakes and parmiggiano-reggiano, if desired. The Food Junkie October 14, 2011 at 8:51 a.m.